Pros: The Leachco BumpZZZ Travel Bed is easy to assemble and dissemble and doubles up as a cushioned seat as well as a bed. Cons: The folded up bed may prove to be too bulky for some. Not suitable for babies. The Leachco BumpZZZ Travel Bed is the ideal travel companion for you and your child. This toddler travel bed could not be easier to assemble as it simply rolls out to form a comfortable bed, play space or couch for a toddler or preschooler. It folds up compactly and is great for travel. 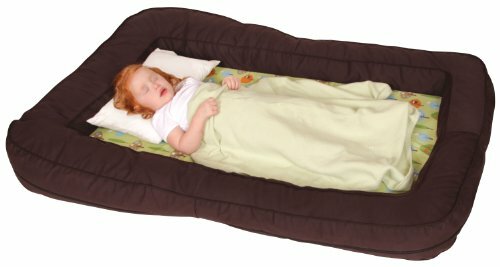 Parents who want a quick, easy and comfortable solution when it comes to a travel bed for their toddler or preschooler. It is best for children who need a soft and comfortable spot to play, read, relax or sleep on and are ready for a toddler bed. One of the pluses of the BumpZZZ travel bed is that it folds over to form a seat, It also has padded foam sides to keep your child comfortable. The Leachco BumpZZZ Travel Bed does not need inflating or assembling, so it is one of the easiest travel beds available. All you have to do is open its bag and roll the bed out. This toddler bed can also be folded over in half to make a comfortable seat or cushion for your child to play on or watch television. The center foam pad, as well as the outer bumper, can be removed easily for cleaning. It comes with its own bag that makes it extra easy to transport around with you. It may not win any lightest travel beds awards’, but it is still light enough at 12lbs that it can be transported from one place to another easily. It is bulkier than other options when folded so not ideal for plane travel. This travel bed has soft padding all over the bed and sides making it very comfortable for your child. It is large in size, so there is plenty of room to wiggle and move around. The Leachco BumpZZZ can support any child’s weight and is ideal for children between the ages of 2 and 6. It does not contain the child and is not suitable for babies. If you are not sure whether your toddler is ready to move into a bed, here’s an article about the move. The Leachco BumpZZZ is completely safe for your child to sleep and play on and meets all safety standards. It has no hard spots, corners or ridges that your child might accidentally bump into. It is not raised, and lies flat on the ground, so there is no chance of your child falling out. This Leacho has raised cushioned sides that help prevent your child from accidentally rolling onto the floor. The bed has a slightly indented center, ensuring that your child remains safely within the boundary of the bed. It is also the most ideal solution if you have rough and overactive kids. You will not have to worry about them breaking any parts of the bed, because there is nothing to break in the first place. The bed is made out of polyutherane foam that is environmentally friendly and will not cause any allergic reactions in your child. The Leachco BumpZZZ comes in an attractive brown/green color combination. The bed is lined with vinyl to contain any spills. The Leachco BumpZZZ Travel Bed is an easy, portable and comfortable toddler travel bed for kids aged 2 – 6. It makes a great play area as well as a bed and a kid sized couch. Unsure if a toddler bed is the right choice for you? Check out our buying guide.